Established in 1972 as the nation's first National Lakeshore, Pictured Rocks hugs the Lake Superior shoreline for 42 miles. 200' high cliffs, miles of pristine white sand beaches, enormous sand dunes, and thick north woods forests are adjacent to the breathtaking beauty and spirit of Lake Superior. She is the largest, deepest, coldest, and most pristine of the Great Lakes, and by far the most beautiful with gorgeous colors of blues and greens, and so clear you can see colorful rocks and shipwrecks forty feet below the surface. I love this lake, and spent many wonderful hours exploring the shoreline in my kayak and on the hiking trails. The fall colors are as brilliant as you will find anywhere, and the winters are spectacular. 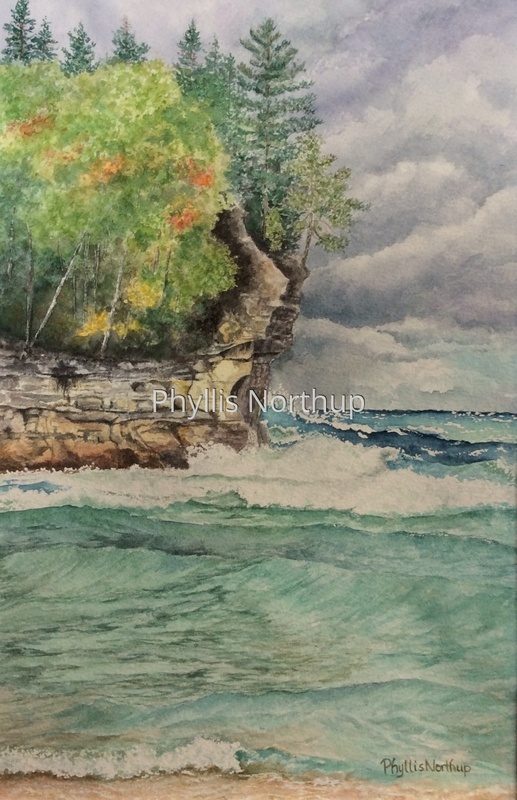 This painting was done from a photograph I took after hiking out to Chapel Beach one stormy September day. This is one of a series of paintings "My Backyards" , celebrating the beautiful places I have been privileged to call home. Framed to 12 x 16. Limited edition prints are now available! Choose your print unmatted or matted and ready for a 12x16 frame of your choosing.